In 2016, Violence Pervaded Policing On Both Ends Of The Gun Officers were targeted and killed by gunmen, while police shootings spurred protests nationwide and prompted law enforcement agencies to take a hard look at use-of-force policies. Mourners raise their fists during a night rally in honor of Alton Sterling outside the Triple S Food Mart in Baton Rouge, La., on July 11. Sterling was one of several men killed in police shootings this year. Early next year, the FBI will take the first steps in developing a national database to track police shootings. Currently, the country's 18,000 police departments report crime information voluntarily, so media outlets and academics such as Philip Stinson, a criminologist at Bowling Green State University, work to create their own comprehensive list of police shootings. "My best estimate is that about 1,000 times a year an on-duty police officer shoots and kills someone," he says. Stinson says prosecutors consider most of those cases legally justified and few officers face charges. 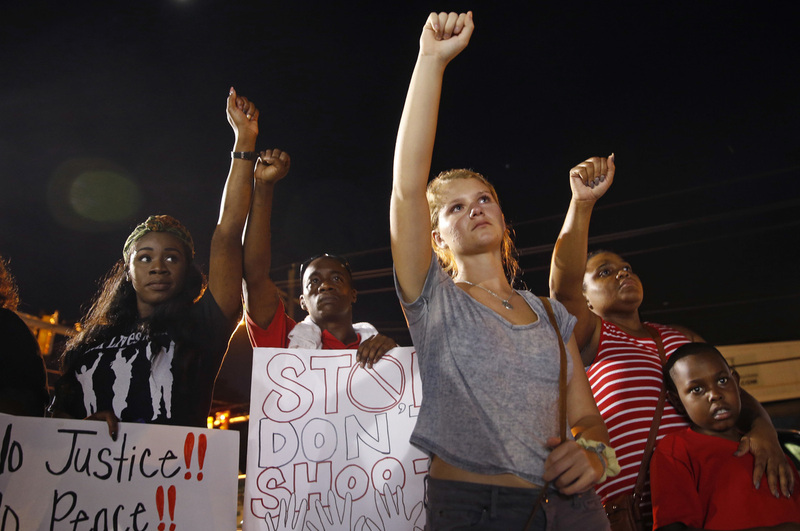 Even so, several police shootings this year drew massive protests and widespread attention. In July, Baton Rouge was a hotbed of protests and mourning after police shot and killed 37-year-old Alton Sterling who was selling CDs outside of a storefront. A bystander's graphic video of his death shows two white officers pinning Sterling to the ground. The very next day, a police officer shot 32-year-old Philando Castile during a traffic stop in St. Paul, Minn. His girlfriend Diamond Reynolds used her cellphone to live video stream what was taking place. Protests flared after both shootings. Later after a peaceful march in Dallas, a sniper targeting police killed five officers and wounded several others before he was killed. During an interview on Fox News, Texas Lt. Gov. Dan Patrick talked about eroding respect for law enforcement. "And I do blame people on social media with their hatred towards police," he said. "I do blame former Black Lives Matter protests — last night's was peaceful, but others have not been, and we've heard the 'Pigs in a blanket.' This has to stop." Patrisse Cullors, one of the founders of the Black Lives Matter movement, says what happened in Dallas was a tragedy. "I think people are smart enough to be able to understand that both things are tragic and that we can't be deterred from fighting for black lives," Cullors says. There would be more killings — three officers ambushed in Baton Rouge — but later in September, police shot and killed men in Tulsa, Okla., and Charlotte, N.C., putting the spotlight back on police use of force and setting off days of protests. The Justice Department's Civil Rights division is investigating the Tulsa shooting. Vanita Gupta, head of the division, says she's also aware that, as the nation grapples with police shootings, many in law enforcement are taking a harder look at what needs to change. "I have been encouraged by the fact that there is a lot of conversation in the field about de-escalation training and implicit bias and procedural justice," she says. Chuck Wexler with the Police Executive Research Forum says he's working with police to develop better use-of-force policies and practices. The Forum's 30 guiding principles include calling for other officers to intervene and prevent their colleagues from using excessive force. "How many cases would have been prevented when someone is obviously getting upset and losing their cool, if another officer had said, 'Hey, step back, let me take over?' That's what you need — cool heads to prevail in some of these situations." Changes like those could begin to build trust and possibly make deadly police-civilian encounters less likely.